Is Idaho the worst place in the world for a wolf to live right now? Evidence suggests it is following the state killing nearly 400 wolves out of a population of less than 1000 in the 2011-2012 hunting season and then becoming the focus of a media storm after a wolf was caught in a leghold trap and then illegally shot at and injured by passers-by. 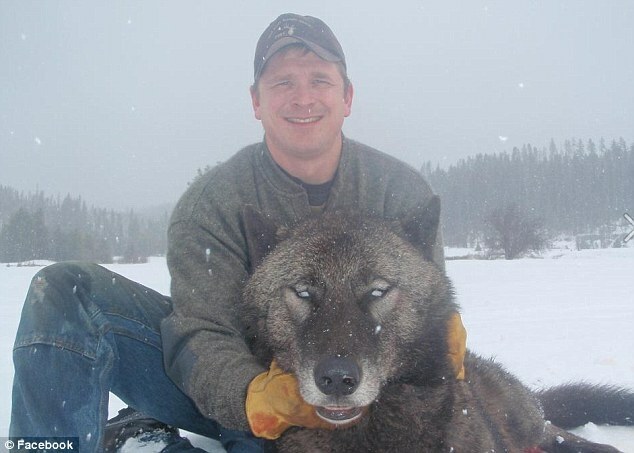 The trapper, known as Pinching is a US Forest Service employee, and photos of him smiling triumphantly and posing with the injured and then the dead wolf were subsequently posted on www.trapperman.com. The photographs show a wolf with its hind leg in the trap and the snow around the wolf stained with its blood in a large red circle. The poor animal looks completely dejected, exhausted and, from its stance and demeanour, you can see it has suffered greatly, and is in pain. The images were quickly removed but not before they went viral after a shocked and horrified audience voiced their protest at such gruesome scenes, and the accompanying comments on the trapper forum that evidently showed the wolf had been tortured over a three day period. You might ask why such animal cruelty is still going on in a civilised nation in the 21st century, but Idaho has very weak animal cruelty legislation according to the Humane Society. Their website states that: “Idaho’s animal cruelty laws are some of the weakest in the country, as one of only three states with no felony level penalties for egregious animal cruelty”. Furthermore, its policy-makers, including Governor, CL “Butch” Otter, have made no secret about waging a war on wolves, and with trapping and snaring being legal, and trappers given carte blanche to get away literally with murder of charismatic wild species, it is easy to see why Idaho, despite its vast wilderness and excellent habitat, may be the worst place to be for the wolf. The comments from other trappers on the forum also indicated that this is not an isolated incident and they are also at complete odds with the Mission Statement on the trapperman.com website which talks at length about their goal of ethical trapping. The site states: “It’s imperative that we show the public who we are and the good we are doing for wildlife.” Did I miss something here? How can torturing a wolf, and revelling in the fact ever be equated with “doing good for wildlife”? Perhaps more worrying is that someone apparently from the trapping community then issued a death threat against a Montana woman on an anti-trapping forum speaking out against the brutality that has been meted out to this particular wolf. This is thuggery at its most vile, and demonstrates a level of psychopathy that ought to be of serious concern to Idaho government officials. It is widely documented that animal abusers are often abusers of family members too. What allows this war against wolves to continue, and which also provides the legal framework for the continuing violence against wolves and other wild species, is the power that minority groups have to shape policy and legislation. According to Safari Club International there are 259,000 hunters and anglers in Idaho; a state that has a population of 1.42 million living in 83,557 square miles. 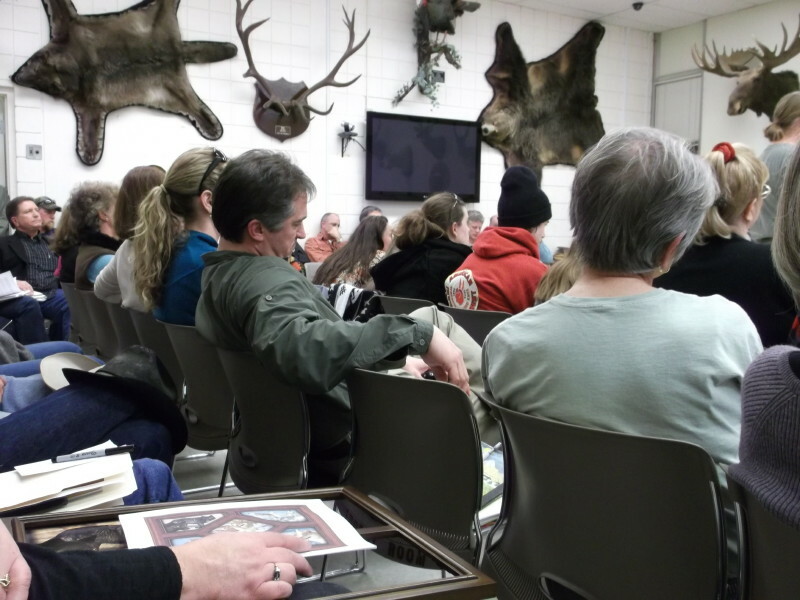 Hunters and outfitters complain bitterly and vociferously that elk numbers are declining, and many claim this is due to wolf predation. However, Idaho Department of Fish and Game, the state’s authority on ungulates, doesn’t agree that the sky is falling on elk numbers. “We’re having trouble in some areas, but overall things are looking pretty good,” big game manager Jon Rachael recently told the Idaho Fish and Game Commission. Female elk numbers meet or exceed objectives in 21 of 29 elk management zones and are below objectives in eight zones. Bull elk meet or exceed objectives in 20 zones and are below objectives in nine zones. During the March 21st public hearing at Idaho Department of Fish and Game, commission chairman Tony McDermott repeated the claim that Idaho is adhering to its public commitment to manage wolves like cougar and bears. But, compare how these species are managed and judge for yourself if this is true. Cougar and bear cannot be sport trapped or snared in Idaho. Wolves can. Cougar and bear are managed for abundant populations. There are approximately 3,000 cougar and 20,000 black bears in Idaho, whilst wolf numbers are approximately 548 adult wolves remaining in Idaho after the state allowed hunters and trappers to kill almost 400 wolves in this season alone. Idaho has reduced its wolf population by nearly half since wolves were exempted by a congressional rider on a budget bill, and yet it has just approved a hunting plan that will allow more wolves to be killed in the next season. There is no quota that sets a maximum number of wolves allowed to be killed. Instead of managing for a healthy population of wolves, Idaho is only interested in maintaining less than 200 wolves in the entire state. If bears or cougar populations fell to that low level, there would be an immediate halt to hunting and actions taken to restore their numbers. And while the Idaho state government doesn’t seem to value wolves, the state is essential to a healthy wolf population in the West. The state is the prime habitat for the core western Gray wolf population and crucial for the recovery of wolves to the Pacific Northwest and expanded range in the Rockies. The arguments put forward for managing wolves at such low levels are that wolves kill livestock and compete with humans for elk. These arguments however don’t merit the discriminatory manner in which wolves are managed. Wolves kill fewer livestock than disease, bad weather, birthing problems, noxious weeds, rustlers and other native predators. Wolf losses are the lowest they have been since 2004 with less than 200 cattle and sheep depredations confirmed statewide. 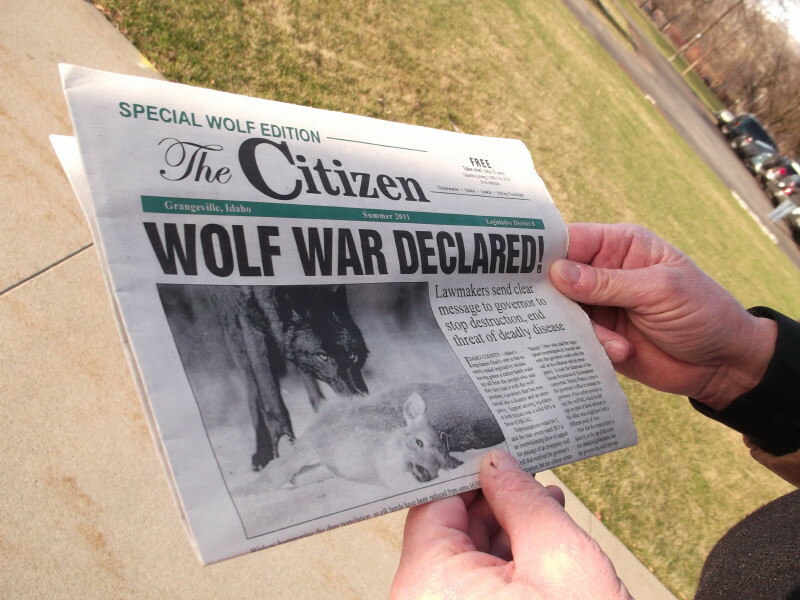 At the meeting, wolf advocates outnumbered those against wolf conservation by 3 to1, and yet the voices of the wolf advocates were totally disregarded and dismissed, with a further meeting being held the following morning to push through the motion to continue hunting and trapping wolves and increase the limits. One of the commissioners even went as far as calling the wolf advocates “crazy environmentalists”, which I find quite unbelievable and shocking in this day and age. In that room there were scientists and professionals speaking out for the conservation of wolves. To call them crazy environmentalists only serves to highlight the arrogance that exists in those who hold power in the state, and who now seem to want to pursue only their own interests rather than the interests of all Idaho’s citizens. The Idaho war against wolves not only ignores the science behind wildlife conservation, but clearly also blatantly ignores the majority public opinion. The real problem, just like anywhere else there is human/wildlife conflict, is a human one. It is the human perceptions of wolves, but the real conflict is between human groups with different and greatly polarised perspectives. In Europe, there are the same problems, but it would seem that wildlife management is way ahead of Idaho when it comes to “grown-up” thinking about co-existing with wolves and other large mammals. In Bulgaria, a country that has also had a history of widespread hatred of wolves, perspectives have started to change with the development of a wolf management plan. The process surrounding the planning has brought together all the different groups and actors including foresters, farmers, livestock growers, hunters, rangers, policy-makers, conservationists and wildlife managers. Bear in mind, that this is also a country with a large ratio of hunters in the population. Poisoning and trapping of wolves occurred many decades ago, but in the late 1970s, when wolf numbers had decreased to around 200 individuals in Bulgaria, the species was included in the National Red Data Book as “endangered”. In 1991,Bulgaria was one of the member countries which ratified the Bern Convention, which prohibits most of the previous methods of hunting for all game species, among which was the use of poisons and traps. These “hunting” methods became illegal! Today, the wolf population in Bulgaria is estimated at around 1000 individuals, in a country territory with only 111 000 sq. km of territory (less than half the size of Idaho which complains that even a few hundred wolves are too many). Recently, the BALKANI Wildlife Society initiated a process for the development of a Wolf Management Plan and invited all interested groups to work together over a period of time to discuss the future management of the species so that it is preserved for the future generations in Bulgaria and the Balkans. Officials, foresters, hunters, farmers, scientists, conservationists worked closely together over many months to develop the plan and agree the main issues for the future conservation and management of the species. The whole process operated on the basis of reaching a consensus, which meant compromises had to be made from all sides and an understanding reached. As a result, all parties did finally reach an agreement that Bulgaria would implement a three month period of protection for the wolves during the months when wolves reproduce and the young pups are very dependant on their mother (April, May, June). This is a major leap forward in a country where hunters and farmers previously had a history of hating and fearing wolves, and where there was? a significant bounty offered for wolves killed that is equivalent to two weeks wages. Bulgaria is not the first nor the only country to adopt such a mature and effective approach towards the conservation of its large wild mammalian species – Croatia, France, Italy to name a few others, are also adopting a more ecological approach to conservation. So, what lessons can Idahoans learn from their counterparts throughoutEurope? It takes foresight and courage for policymakers to really make a difference in protecting their wild heritage. Idahohas never engaged its stakeholders in a meaningful conflict resolution process. At the moment Idaho’s governor and state officials appear to the rest of the world to be failing miserably in this respect. There needs to be some sensible dialogue taking place and not the mud-slinging and fear-mongering and revenge killing of wolves that is the current default position. Governor “Butch” Otter of Idaho, the world is watching, and you are being judged on how you treat your wild species. ‘’The greatness of a nation and its moral progress can be judged by the ways its animals are treated ~ Mahatma Gandhi‘ (1869-1948)! The situation in Idaho is directly due to the inadequate delisting criteria approved by the federal US Fish and Wildlife Service. Wildlife scientists around the world should protest any plan that allows all but 100 – 150 wolves to be killed in a state likeIdaho. Unfortunately, the Service and the Obama administration failedIdaho’s wolves and are soon to approve a plan allowingWyomingto followIdaho’s lead in reducing wolf numbers to ecologically unsustainable levels. This article was written for Wolf Print, an international magazine published by the UK Wolf Conservation Trust which is run largely by volunteers who work tirelessly to help wolves in the wild. Although the UK lost its last wild wolf in the 17th century, conservationists here are keen to see that wild wolves elsewhere don’t suffer the same fate and enjoy protection not only because of the vital role they play in the ecosystem but also for future generations to enjoy. Suzanne Stone provided additional information for this article and is the Northern Rockies Representative for the Defenders of Wildlife. She has worked tirelessly for the conservation of wolves for 24 years including serving as a member of the USA – Canadian wolf reintroduction team for Idaho and Yellowstone. For the last 12 years, she has worked closely with ranchers and farmers to help them co-exist with wolves by adopting non-lethal control methods and livestock protection through better animal husbandry. She grew up in Idaho and still resides there today. Elena Tsingarska is a biologist and Project Leader for Balkani Wildlife Society in Bulgaria. She has studied wolves in the country for many years and has been the driving force behind the recent successful Wolf Management Plan process. She has also been one of the leaders in the team behind the building, development and equipping of the Large Carnivore Education Centre based in Vlahi in the foothills of the Pirin Mountains. In the past ten years, the project has provided outreach education programmes to over 10,000 children throughout the region, as well providing workshops and seminar programmes for adult learners on the conservation of wolves, bears and other wild species in Bulgaria. 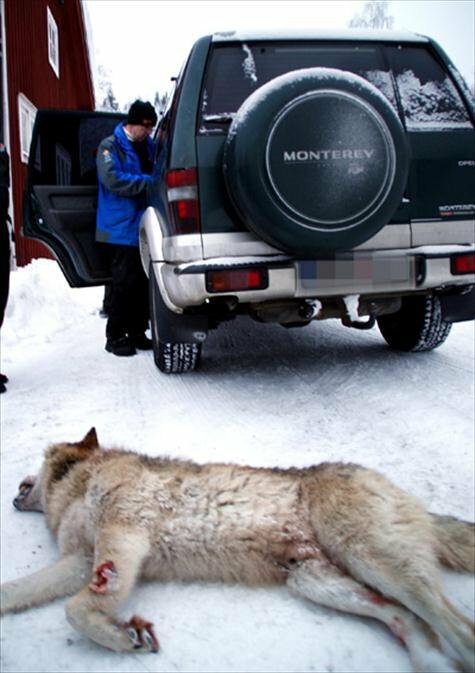 A cull of 20 wolves began in Sweden on Saturday 16 January 2011; the second in 45 years. The Swedish government granted over 6000 licences to hunters, and by Monday 14 wolves had been shot and killed. Apart from stirring up the international outrage of conservationists, this slaughter of one of Europe’s top predators is actually illegal. Sweden’s flouting of European law, however, has not gone unnoticed by EU Environment Minister, Janez Potocnik, who is now starting court proceedings to bring the Swedish government to account. The wolves in Sweden have a very narrow genetic gene pool, which stem from just a few wolves in Finland and Russia. And hunters and policy makers are now using this as the reason for the cull. They claim they are doing it for the future benefit of the population as a whole. Certainly, biologists have seen the genetic pool as a problem for many years. But the answer is not to kill a significant proportion of the wolf population. This can instead be resolved by strengthening the gene pool, and translocating wolves from elsewhere in Europe. The real problem here is that wolves depredate livestock and hunting dogs, and the farming and hunting lobby has a powerful voice in Sweden. Hunting dogs are allowed to run free in habitat that is occupied by wolves, and a number of these are killed each year. Hunters also see the wolves as competitors for prey species. So essentially, what they are saying is that hunters’ rights come before those of a species that should be entitled to go about is daily activities in its own natural habitat. Livestock depredation is another problem, but again this can be resolved with better animal husbandry and livestock protection measures. Ironically, Sweden itself was part of the international community that castigated Norway a few years ago for culling 10 of its 20 wolves, and lambasted the country for its lax farming practices and livestock protection, and for killing wolves that had shared territory across the border between Norway and Sweden. The economics of hunting must also bear scrutiny. Granting over 6000 hunters a licence to kill just 20 wolves has certainly increased the coffers of the Swedish government. I also question both the integrity and skill of some of these hunters. It has been reported that a number of the wolves have suffered horrendously as hunters have taken pot shots at them. One male wolf was hit several times and suffered greatly before finally bleeding to death. Wolves are creatures with a high level of intelligence. They are social animals that live in closely-bonded family groups, and more importantly, as apex predators, they are a vital part of the ecosystem. More than could be said for human hunters and their dogs! I have written personally to Janez Potocnik, and would encourage others to do the same. His contact details are at the foot of the page, along with links to other news articles. The international community needs to support the EU minister positively but firmly in his decision to take the Swedish government to court over this illegal practice. The international outcry is justified, and the Swedish government should be pursued through the European legal system and an example made of a country that so blatantly flouted international law. Granting the huge number of licences it did was also a mistake and has sent completely the wrong message. If the issue was really about the genetic pool and maintaining the health of the population as a whole, then surely a cull should have been carried out properly by government officials. The Norwegian cull involved just a handful of hunters, and although there was also an international outcry over this, the cull was carried out effectively by far fewer hunters. And in an attempt to appease the hunting and farming lobbies, Sweden has missed an amazing opportunity. Just imagine the tourism dollars Sweden could have attracted had they taken the other course of action open to them, which was to ensure a healthy and viable population of a charismatic predator. Yellowstone National Park is testament to this. It is estimated that Yellowstone now receives between $7 to $10 million each year from wolf tourism. Early in the wolf reintroduction programme an economist warned that Yellowstone would lose revenue and make just $500,000 per annum as a result of wolves taking game animals, which would leave fewer elk for hunters and result in lost revenue for outfitters and other hunting-based businesses in the park. How wrong this was. And Sweden should take note! For me this cull is a complete travesty. It has taken us back to the dark ages of wolf persecution, and in a country that I believed to be more tolerant of its large carnivores. But apparently not! The wolf cull is illegal, whatever reasons Swedish ministers give to justify their actions. This should therefore be pursued using the proper legal channels. Sweden is citing the small genetic pool as the reason for the cull, but have shown no attempts to address this situation through the translocation of wolves from other parts of Europe. It does not take 6700 hunters to kill 20 wolves. The conditions for hunting have been favourable, with snow on the ground making the wolves highly visible and easy to track. If the wolf cull was deemed necessary (and this is a big if), then Government officials should have carried this out appropriately with an organised cull. The Swedish government have not put forward any scientific justification for the cull. Yes, there is a problem with inbreeding within the population, but this could be addressed other ways. The rights of hunters and farmers are being put above those of the wolves and other members of the community, including the international community. This is morally and ethically wrong.